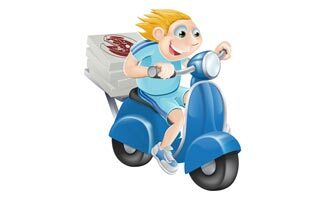 Home > Food > Restaurants > Looking for a Food Delivery Service From Local Restaurants? Imagine how awesome it would be if you could have food delivered to the doorstep of your Winston-Salem home, even from restaurants that don’t officially offer a delivery service. We’re happy to announce that your wait is over, thanks to services such as Takeout Central, a local company that has expanded to several North Carolina cities. The site lets you choose from a number of local Winston-Salem restaurants, and hires local drivers to order, pick up, and deliver your food (minimum order of $10) for a low delivery fee of $2.99-$3.49 per restaurant (plus tax and tip; the cost may be slightly higher for restaurants that are far away). The website interface is very intuitive: you simply select a restaurant from the left-hand side, choose the items off of a menu that you would like, and then check out (you can choose to pay by credit card or cash). The great part is, you can order from multiple restaurants, so if someone in your party wants a dish from another restaurant, it can all arrive in one order. From our experience, ordering times are usually an hour or less. You can also customize your order, which means you can put in special requests like “no olives” for a pizza. The interface supports options that already exist on the restaurant menu, so you can add salmon or chicken to a salad with the click of a button. Is This Service Also Available in Greensboro, Highpoint, Or Kernersville? What Other Food Delivery Services Serve Winston-Salem? Door Dash – a national brand that is quickly spreading across the nation. Door Dash they offer good prices, lots of restaurants, and a map that shows you in realtime where your driver is so you can anticipate their arrival. Get a $5 discount on your first order by clicking here. The services below are other options at your disposal, but don’t offer nearly as many restaurant options (although some of their supported restaurants are not included with Takeout Central, so worth a look)! Which Winston-Salem food delivery service have you tried or do you recommend? A lot of places don’t deliver anymore. It’s good to know that you can still get food delivered that isn’t just pizza. Sometimes you just don’t feel like going out to get food so it’s nice to have it brought to you.